Millennials are a hard-working generation (73% of them working more than 40 hours per week) and are poised to become the largest percentage of workers by 2020! A 2018 survey by the Manpower Group has examined how over 19,000 millennials feel about their career, what motivates them, and what they actually want in the workplace. For program managers who are developing their three-year wellness and well-being plan, this data is especially beneficial in helping with the evaluation of existing programs and building new ones that increase engagement and work towards the promotion of an exciting and rewarding career for ALL employees. Intrinsic Motivation (IM) is what drives each of us to do something for personal satisfaction, instead of an external reward such as money. This self-motivated desire flows from within and drives an individual to engage in a task, or pursue a goal with enthusiasm, because it is interesting and enjoyable. However, IM also works along-side the external tangible benefits such as one’s professional role and having a good salary, generating a workforce that enjoys work-life balance, job satisfaction with one’s tasks, appreciation for activities completed, and challenging assignments. Dissatisfied employees do not feel that they are realizing their potential; they feel a lack of communication or that their work lacks purpose. These emotions increase stress on the individual, place limitations on their ability to perform their daily work well, resulting in a disengaged worker who eventually leaves the company, which increases recruitment costs. Connectivity is enhanced by valuing an employee’s contribution and through the visible support from managers. In turn, motivated employees enjoy their work and promote the company and its products passionately to friends as a great place to work. 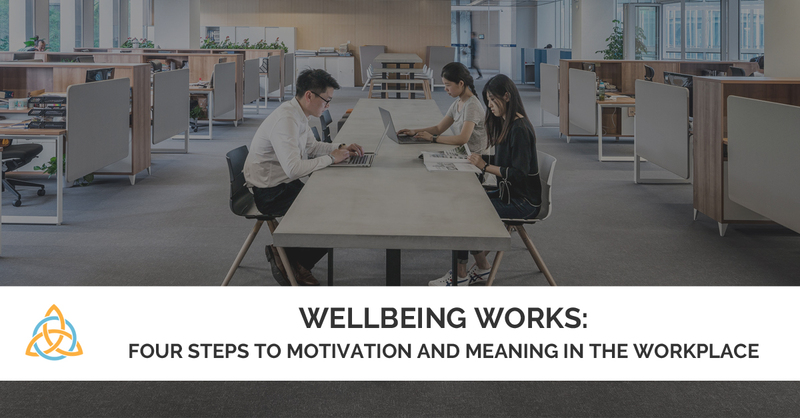 Wellness programs that evaluate and respond to change are ones that will continue to ensure that ALL employees have the opportunity to advance their career in an empowering environment that promotes wellbeing, wellness, and balance. Margaret Stockley is the CEO of the Aspire2 Wellness Group and the founder of the Professional Organization For Wellness Certification (Powcert) providing workplace wellness programs and training to help companies increase employee engagement and reduce health costs. She is the author of “Transforming Workplace Wellness”, and co-author of “Inner Knowledge” and the CD “Multi-Sensory Meditation”. Margaret volunteers on the annual conference committee of the WWCMA and is a Level 2 TriYoga teacher.